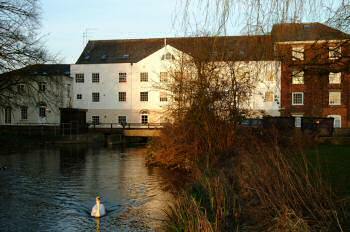 The Mill was built in the 1780s and functioned as a working mill until 1980. It had several distinct areas; the silo for drying, the mill itself, the corn store and offices. The last company to operate the mill as a working mill was a firm called Dewing and Kearsley. I have volunteered to help with compiling the town archive and I am hoping this will give me a chance to research the mill's history. I suppose the first time I became aware of the mill, which was to become our home was some forty years ago when we moved to Norfolk. I used to drive past it each day from the village where we lived to my place of work in Fakenham. The back of the mill was a jumble of bits added on over the years but the front looking out over the mill pond was not much different in appearance to what it is today. For the life of me I cannot remember the tall chimney so maybe that was demolished prior to us moving to the area. In 1980 the mill ceased to operate as a working mill and plans were lodged to turn it into private homes, the lower end was turned into three cottage style dwellings but the rest of the mill was neglected and continued to deteriorate and fall into disrepair. This is where my story really starts. In 1986 a builder friend of mine, a really "good old Norfolk Boy" came to see me; we had talked in the past of my desire to design my own place or to renovate an older property, nothing more than a pipe dream on my budget. Derek, the builder, was as trustworthy as the day is long and his news was that he had bought the old mill and removed all the machinery, knocked down the ramshackle outbuildings and gutted the building and removed the foundations prior to installing massive new foundations to carry the extra weight. He asked me if I would like to buy an apartment and I was a bit hesitant at first, that is until he told me the price and then I jumped at it. The problem was he needed several firm contracts placed, four I think, before the bank would advance any more funds for the work to continue. He took me down to the mill and we stood on the brick linings where the foundations had been removed, looked up past the gutted interior through the gaps in the tiled roof to the evening sky. He said "You can have that bit on the second floor between the white marks on the rafters, design it how you like but the services have to come down there and I need at least two load bearing walls, the rest I can put beams in". He gave me a rough plan and the dimensions, a generous two bedroomed size. We were on our way. My brother's first wife came to stay with us and we showed her "Our Project" she decided there and then we were stark staring mad and I suppose she had a point. This is where I had my one and only problem. The Building Society I had always used refused to even consider the property until it was completed and ready to occupy, they, the Halifax, were more used to square boxes built in their hundreds just like the ones we had lived in up to then. Imagination was not their strong point. I approached my bank, Midland, with some trepidation they looked at the plans, checked up on Derek called me and told me they were prepared to go ahead gave me a written offer of acceptance and told me that they would advance the funds whenever I needed them. Just to show how times have changed the price was £30,000 and the mortgage £25,000. I then took what I call a "Buy the tie and then look for a suit to go with it approach." We went to Habitat ordered the furniture and lighting telling them we would confirm a delivery date later, took careful measurements of all the items and came home fully equipped with the information we needed to draw up the plans consequently everything fitted just right, I designed it with one large bedroom, a large living room some forty foot long with views over the mill pond at one end and views upstream at the other. The bedroom also looks out over the millpond and the huge kitchen looks out upstream with the breakfast bar directly in front of a window. One problem I had to overcome in the living room was getting more light in as with its length it could be a bit dark in the middle, this was overcome by angling the walls at either end to borrow light from the kitchen and bedroom, this also gives some shape to the room. right? The kitchen units were traced and ordered as were the bathroom suite and fittings. A proper bricked in shower was part of the design something we have always wanted. It could not be this easy could it? One little thing about Derek he would never ever let you down but I didn't call him "Mañana Man" for nothing. The "Mañana Man" factor together with our impatience to move in begun to make the wait unbearable but eventually some three months late we moved in, the first to do so. The stairway was rickety, The front door secured with a large padlock and of course no electricity fortunately they only let us down by three days!!" Over the next three or four weeks all these problems were rectified and we begun to enjoy our dream and I felt very pleased with my design as everything worked just as I had planned it. Mind you I would never have heard the last of it if it hadn't. My wife's work had always been in design and my best friend was an award winning architect and I would not let them anywhere near it. This was my dream and my chance to do something creative for the first time in my life and I was going to sink or swim on my own efforts. Well we are still here and still enjoying it. I think my wife is still surprised that I managed to pull it off. Would I take this risk again? Yes but only with Derek definitely not with any other builder. Would I change anything? Yes, with hindsight as prices and my life have gone I wish I had bought the apartment next door as well and had two extra bedrooms, a second bathroom and a study come library. Isn't hindsight a wonderful thing? The garden area which is shared by all in theory is in fact looked after by very few of us, over the years we have planted bulbs, shrubs and herbs. We were all keen not to create a suburbs style garden but to keep it is natural as possible. We planted honeysuckle and the herbs for their fragrance as well as their culinary uses and shrubs and bulbs to lead naturally to the trees in the background. We are now tidying up our part of the river bank Irises, Hostas and a gunnera will be planted when we get round to it. I am turning into a bit of a Mañana Man myself. when the weather is warm and the river and wine is flowing ----- well you know how it is. I spoke to Derek about the mill a little while ago and asked him if he had any regrets, he had but one and that was the number of second homeowners who have bought homes here. He wanted them all to be local homes for local people. I retired on the 28th September 2001 and my wife on the 2nd November in the same year. or even a jacket preferring to wear either scruffy or smart casual. We planned to spend the early part of the year decorating and improving our home in part of a restored Mill, this we managed to keep to, completely re-decorating and laying laminate floors throughout. The problems came as the Spring warmth tempted us more and more to spend our time outside by the river. There are trees on our private length of river bank and their boughs sweep down to touch the water. We set to to create a living arbour by some judicious but light pruning making a small area just large enough for a table and chairs with our backs to the relief stream and our faces to the river. The other residents of the Mill seem to prefer to use the terrace so that they can hear if a telephone rings or someone comes visiting so our small patch has become truly ours. In spring we saw the visits at dawn, infrequently, and dusk, much more frequently, of the Kingfisher as he called for his breakfast or for a bite to eat on his way home almost as if he was on his way to and from work. He would perch on the steel bar over the sluice just feet away from the housing for the lifting mechanism where the Grey Wagtails had built their nest and were feeding their young. These birds the Kingfisher and the Grey Wagtails seemed to use the river like a fast food joint, the Kingfisher not tarrying long and the Wagtails departing with empty beaks but after a few minutes flying and sweeping over the river returning with beaks stuffed full to feed to their offspring. A veritable high speed fly through restaurant. We watch the plentiful Mallards, the dab chicks and the Moorhens who are a timid bird but they come close to the dappled shade of our hideaway. There are Swans to but we try to discourage them from staying. We know from some past years that if they nest they will drive off the other wild life to secure the maximum amount of food for their young cygnets when they are hatched even to the extent of drowning any young ducklings foolish enough to stray too close. These large elegant birds are ruthless in their establishment of their feeding area. their behaviour paralleling that of some humans. We also have a pair of Muscovy ducks known to us as Compo and Nora who, when we first saw them, were in full moult and these birds, not handsome at the best of times, made Nora's wrinkled stockings and Compo's string tied trousers look positively elegant by comparison, but they are our constant companions never wandering far. They to, like human couples, have their squabbles and will avoid each other sometimes for several days but eventually they will make up and be seen together again. fall to intercept the next morsel. In late spring we take the first of our holidays, taking our Grand-daughters to stay for a week in the castle on magical Brownsea Island, a favourite haunt of ours. Here there are literally hundreds of peacocks and peahens, a bewildering variety of chickens, French partridges and the Island is home to a large number of Red Squirrels. The Island has a history varying from being a grand Island retreat, a working community producing cut flowers and the clay for sanitary ware and a home for a recluse who let the Island return to it's wild state. In spring large areas are covered in Azaleas and Rhododendrons other areas are smothered in Bluebells. Truly a wondrous place. This was our first holiday actually taken although if we had stuck to our plans it should have been the third but that is how our lives had become. As summer arrived the shade in our hideaway had deepened and we had begun to take our lunch, a bottle of wine and books out with us. We have over the years ate in many fine restaurants but the French bread, pate and cheese we lunched on was their match and as to the wine in our time we have partaken of the wines of the Pomerol but none tasted better than the robust cheap reds we drank at the rivers side. We have over the years planted herbs and the perfume of Rosemary, Thyme and Mint would combine with the Honeysuckle on the summer's breeze. Often we would return indoors the books unopened and forgotten. We would often grin inanely at each other in sheer pleasure. During the school holidays our Grand-daughters would sometimes join us sometimes searching the riverbank and other times wading in the river with small hand nets or turning over rocks and stones to see the freshwater Crayfish that lurk underneath. Later in August we took our Daughter and Grand-daughters on a far more boisterous holiday to a holiday camp. Apart from trips out and short breaks this was to be our last holiday of the year although we had planned to have four. to. So plans were made and this time cakes were made and other Christmas fayre which had always been either made in a hurry or bought ready made were made in the traditional way. We have not eaten much at all during the year that we have not made ourselves from raw ingredients and have been all the better for it. We have learned to cook new dishes most of which were highly palatable, some were really delicious, some merely edible but even in this we learnt from our mistakes. been us, the river and grand-daughters or friends but mainly just ourselves. so that we can extend the day further into the evening. We have tentatively found a couple of places we would like to visit and we shall go back to Brownsea Island but we have learnt the folly of planning because we have realised that going away on holiday can get in the way of enjoyment. When I retired I had some twenty or so unread books to look forward to but I left a list of books several hundred titles long with my favourite book stallholder, Ken, at the weekly market in North Walsham where I used to work. Every six weeks or so we pop over with an updated list to pick up the usually ten or so books he has acquired for me. He only charges fifty pence to a pound for second-hand books and one pound fifty to two pounds fifty for new ones, the dearer, or should I say less cheap, being hard backs. I have just looked on the unread books shelf and seen that, in spite of all the books I have read in the past year, I have some forty five books there waiting to be enjoyed. If next year is as enjoyable as this has been we shall be well contented.